Lower eyelid ectropion is an eyelid malposition in which the lower eyelid margin is turned away from its normal position in contact with the eye. The condition is commonly age-related but can also occur in patients with skin problems e.g. 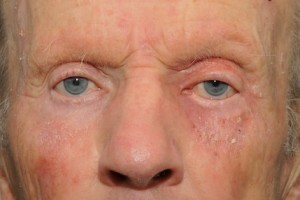 severe eczema, following an injury/burn, or in patients with a facial palsy. The ectropion leads to overflow tearing of the eye (epiphora) and discomfort. This can lead to a vicious cycle of secondary events and needs to be addressed early. 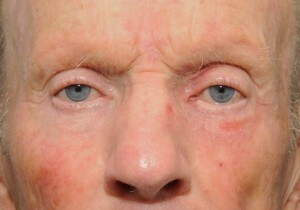 Epiphora may lead to irritation and contraction of the skin of the lower eyelid that further worsens the ectropion. In addition, the patient tends to continually wipe the lower eyelid, which in turn results in eyelid stretching that further worsens the lower eyelid ectropion. If the condition is neglected, the conjunctiva on the inside surface of the eyelid becomes exposed and eventually thickened. 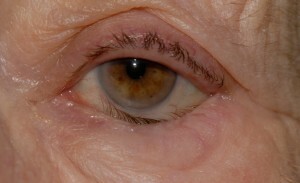 The patient’s eye may show associated dryness. Lower eyelid entropion is an eyelid malposition in which the lower eyelid margin is turned inwards against the globe causing discomfort from contact between the eyelashes and the surface of the eye. 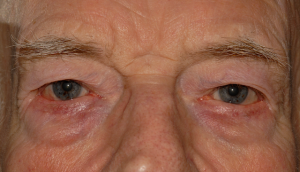 An entropion is usually involutional (age-related) and the majority of these are therefore seen in older patients. The treatment of the ectropion depends on the underlying cause. Most patients undergo surgery to tighten the eyelid at the outer aspect of the eyelids (a lateral tarsal strip procedure). 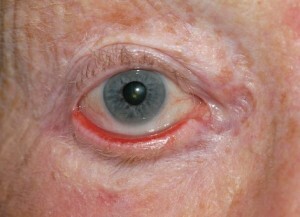 Some patients with shortening of the skin of the eyelids require a skin graft. This can be taken from the upper eyelid, from behind the ear or from the upper inner arm. Some patients develop a lower lid ectropion due to the development of an allergic dermatitis which requires medical treatment with a steroid cream after identifying and removing the causative factor e.g. glaucoma drops/antibiotics drops to which some patients develop an allergy. In the case of acute spastic entropion, the treatment is directed to the provoking stimulus e.g. in growing eyelashes, blepharitis, dry eye. Although a bandage contact lens or botulinum toxin injections may improve symptoms temporarily, these are rarely justified. The use of lower lid tape can be advised for use in primary care while the patient is waiting to be seen by an ophthalmologist. These procedures are usually performed under local anaesthesia with or without mild sedation “twilight anaesthesia”. Everting sutures have been commonly regarded as a temporary form of treatment but many patients achieve a permanent result with the sutures alone. If the entropion recurs they are offered a repeat procedure or a more definitive surgical procedure. The sutures are very quick and simple to insert in a clinic setting and provide instant relief for the patient.For all other patients, a lower eyelid retractor advancement combined with a lateral tarsal strip procedure is performed in the operating theatre. This is a very convenient operation for the patient as no sutures need to be removed. It does, however, leave a sore tender lumpy area at the outer corner of the lower eyelid for a few weeks before this settles. You will have your blood pressure checked by the nurses. The nurses are also happy to answer any further questions and to show you the facilities at Face & Eye, including the operating theatre if it is not in use. The rest of your face is then examined. Photographs of your face and eyelids are taken before surgery so that the results of surgery can be compared with the original appearance. The photographs are confidential and can only be used for any purpose other than your own records with your specific written permission. 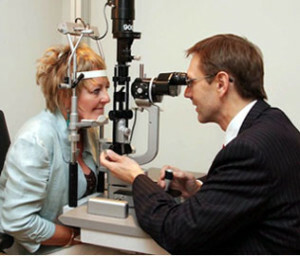 All our patients are provided with a detailed report following a consultation. This summarizes the consultation, the recommendations and also the preoperative and postoperative requirements. What are the possible complications of this surgery? Most complications of eyelid surgery are amenable to successful treatment. Blurred or double vision, lasting mainly for a few hours, and sometimes up to a day or two after surgery. This may occur for several reasons – ointment put in the eyes immediately after the operation, local anesthetic used in the operation, swelling of the muscles that control eye movement or swelling of the normally clear covering around the eye (the conjunctiva). Swelling of the conjunctiva (this may mimic a severe hay fever reaction) is referred to as “chemosis” and in some patients can take a few weeks to resolve. If blurring persists for longer than 48 hours, it is important to inform your surgeon. Bleeding. A collection of blood around the eyelids or behind the eyeball, is called a hematoma. A sudden hematoma behind the eyeball can cause loss of eyesight if not managed appropriately and without delay. This is the most serious potential complication of this surgery but is extremely rare. An oculoplastic surgeon is trained to prevent and to manage such a problem. A hematoma usually needs to be drained in the operating theatre. Asymmetry. 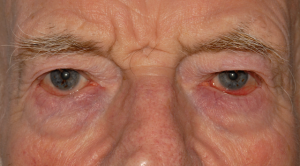 It is impossible for any surgeon to achieve perfect symmetry although an oculoplastic surgeon strives to achieve this. Further surgery may be required to address this. 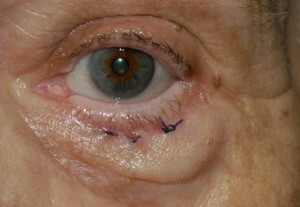 After this surgery, the eyes are initially covered with pressure dressings for approximately half an hour to reduce postoperative swelling and the wounds are treated with antibiotic ointment. The dressings are then removed and replaced with cool packs. For some patients the dressings may be left in place for a longer period of time e.g. if a skin graft has been required to manage a lower lid ectropion which has been caused by tightness of the skin. Activity is restricted for 2 weeks to prevent bleeding. You will be asked to clean the eyelids very gently using clean cotton wool and Normasol (sterile saline) or cooled boiled water and repeat the application of antibiotic ointment (usually Chloramphenicol or Soframycin) to the wounds 3 times a day for 2 weeks. The sutures used for this surgery are usually dissolvable but are often removed in clinic after 2 weeks. It is important to devote a lot of time to your aftercare for the first 2 weeks and some patients find this somewhat labour intensive. To learn more about Ectropion/Entropion Surgery, please contact us at today to schedule an appointment.